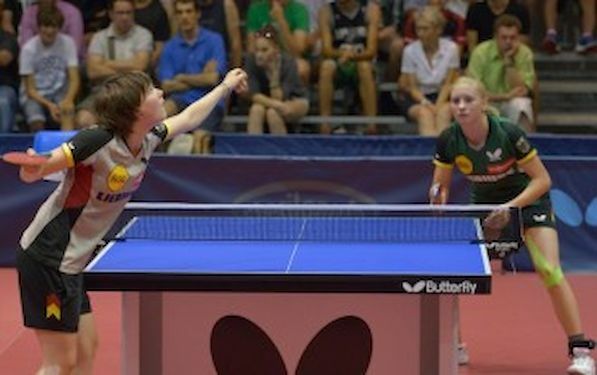 In the duel between top European players, Chantal MANTZ beat last year’s champion Nina MITTELHAM. MANTZ of Germany is the new Junior Singles Event champion. In very close and emotionally demanding final CHANTAL showed very aggressive performance. Before this final, MANTZ lost four times in the last stage of the European Championships. In the semi final both German representatives showed impressive performance. Nina MITTELHAM was first to leave the arena victoriously. She beat Pauline CHASSELIN of France. “I started to play only two weeks ago. Since November I struggled with injury. I am so happy that I improved my game here during the Championships. It was difficult to play against CHASSELIN and that maks me even more happy,” said MITTELHAM. Chantal MANTZ admitted she was afraid before the match against Ekaterina GUSEVA of Russia started. “We have not play against each other since Kazan. And on our last meeting she beat 3:0 without any chance created from my side. Here she played tactically different but I managed to eat her,” said MANTZ.